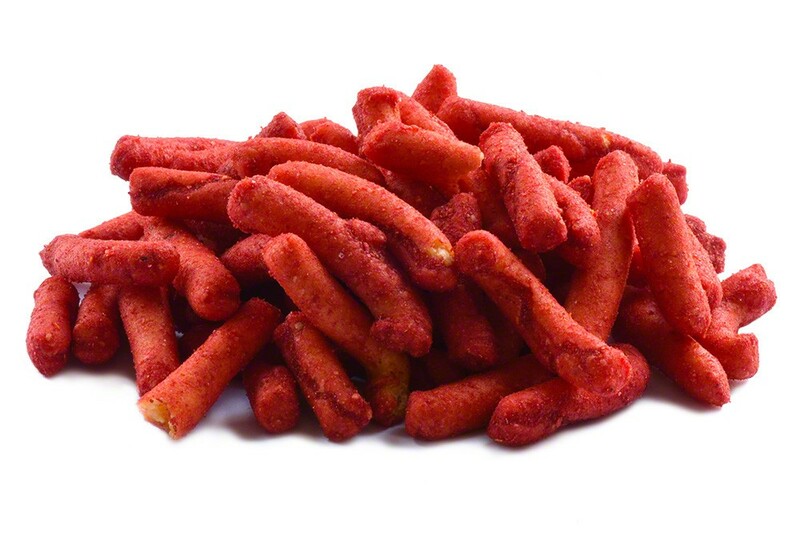 Shake up snack time with these sassy spicy Churritos. They are wonderfully crisp. Their heat level falls at the medium mark on a hot and spicy scale so you don't have to worry about them being overpowering. Snack becomes a feast for your taste buds when you choose this tantalizing treat to enjoy anytime of day. Yellow Corn Masa, Soybean Oil, Hot Sauce Seasoning (Maltodextrin, Dextrose, Salt, Spice and Coloring (Contains Paprika), Monosodium Glutamate, Citric Acid, Onion Powder, FD&C Red #40 Lake, Sugar, Garlic Powder, Hot Sauce (Aged Cayenne Red Peppers, Vinegar, Salt, Garlic) Natural Flavoring, Lactic Acid, Cottonseed Oil, Spice and Herb). Contains Soy. Way too hot for me, but have a lot of crunch. I’ve enjoyed them in other trail mixes, so, maybe, I’ll mix them up with other ingredients. Very fresh. These taste like spicy doritos rolled up into a perfect little bite. They are a great snack and are just the right amount of spice as to not polarize any guests. this has a good spiciness to it, everyone loved it even our kids who are 6 and 8! I absolutely love these so much. I moved from Nebraska, where they were sold in my local marshalls, to Florida where I can’t find them at all!! I’ve searched for months and I’m so happy I’ve found them. Definitely not like others I’ve tried, so good!! !